Cold Steel Warehouse Find! 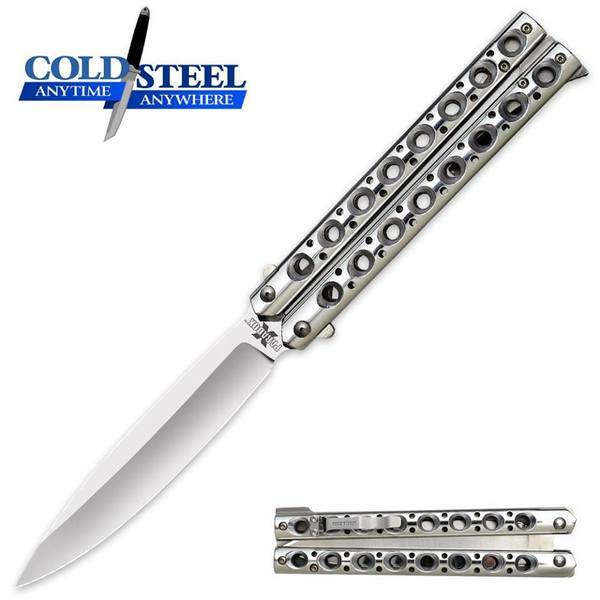 Paradox Butterfly-Style Knife.. Knives For Sale - Other Factory, mid-tech and production knives for sale. These knives are represented by the sellers. The Cold Steel Paradox was designed from the ground up to specifically mimic a traditional Balisong or Butterfly knife in every respect but one – it can't be opened with one hand! That's right, the Paradox is not a switchblade, gravity knife, or assisted opener and can't be opened without the use of both hands. So, while it looks like a classic Butterfly knife from the early 80's, and feels like one in your hand, it isn't. Its twin handles feature two integral springs that are similar to a conventional slip joint folder. They are designed to rotate 180 degrees around the blade's unique split tang and use strong opposing spring tension to lock the blade open or hold it firmly closed. Don't worry about it taking two hands to get it into action, since once its opened it will never close inadvertently. Plus, its locking mechanism is impervious to the most violent stress and shock imaginable.